Citroen 2CV 70th Anniversary: What can manufacturers learn from their past? 1948 was notable for the launch of not one, but two long-running affordable cars for the masses. They are the Morris Minor and the Citroen 2CV, which both went on to sell well into seven figures. So, 2018 marks their 70th anniversaries, but rather than indulge in some rose-tinted reverie, these cars have an important role to play in guiding the design of future models. It’s perhaps telling that both of these cars were designed and guided through to production by small, dedicated teams with an unflinching focus on the job. For the Minor, that was Alec Issigonis, who went on to further fame as the designer of the Mini. At Citroen, company boss Pierre Jules Boulanger laid down the ground rules for this simple machine before World War II. It was then up to the design team of André Lefebvre, Flaminio Bertoni and Walter Becchia to create a car that met those criteria while still being usable and low-cost. 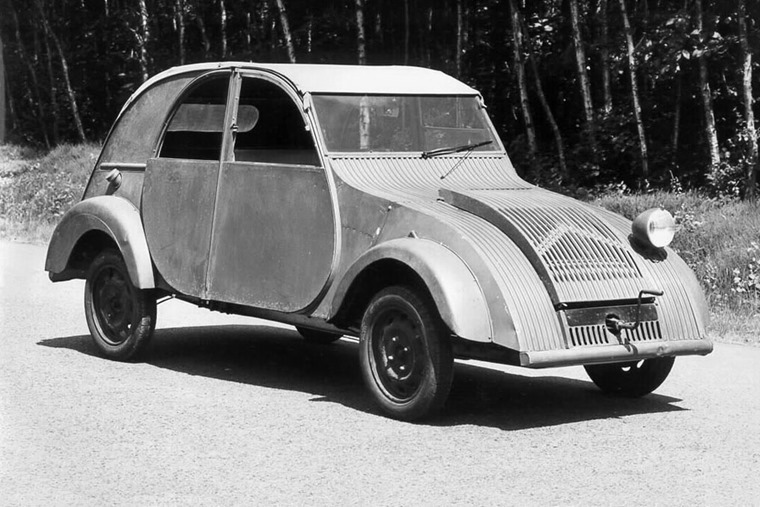 Early prototypes of the 2CV looked like garden sheds on wheels, but by 1948 the car had developed into something that appealed to the masses in France. Like the Morris, and the Volkswagen Beetle that preceded them in 1946, the Citroen was aimed at the bottom end of the market but ended being classless. Its functionality outweighed any snobbery and plenty of wealthier drivers adopted it as transport because it did the job and no more. Citroen was even bold enough to produce the 2CV in the UK at its Slough plant, though these models were marginally more opulent than the early French versions. Sales were not in the same league as models from British car makers, so the Tin Snail’s production crept back to France, where it stayed until 1988 when the last of this iconic model were made in Portugal. When the final 2CV rolled off the line in 1990, there was much sadness among its fans, but it was clear that an early post-war design was never going to pass muster in ever-tightening crash and emissions tests. However, that doesn’t mean we should dismiss the 2CV in modern thinking. Quite the opposite, in fact. Look at the way the car market is developing and the need for lightweight, simple, efficient cars is ever more pressing. The 2CV should stand as an example from history of how to get it right. Citroen has tried to rekindle some of that 2CV love over the years with styling touches in the first generation C3, which was a fairly dismal supermini. There have also been concepts from Citroen and others in an attempt to recapture the look of the original. It could be argued the current C4 Cactus comes closest to encapsulating what was best about the 2CV in it sense of fun and daring looks. However, rather than trying to ape the lines of the 2CV, what Citroen and other car companies should be studying on the 70th anniversary of this influential car is the brief that created and the way this was achieved. Too many modern car designs are arrived at by committee and focus group. It shows in the rash of ‘me too’ crossovers and SUVs now on offer. Yes, the market leads this to some extent, but car makers are the ones designing and building them. Also, history shows that car companies prepared to take a punt often win by being first. Nissan did this with the Qashqai long before the rest of the industry cottoned on to crossovers. The same with the original Mini that set the template for all city cars and superminis to this day. So, car companies and their designers need to stop worrying about what’s happening at other firms and concentrate again on pared back design briefs. Set those targets, stick to them and the end result will always be interesting, unique and appealing so long as the first principles are drawn from an understanding of the intended market. 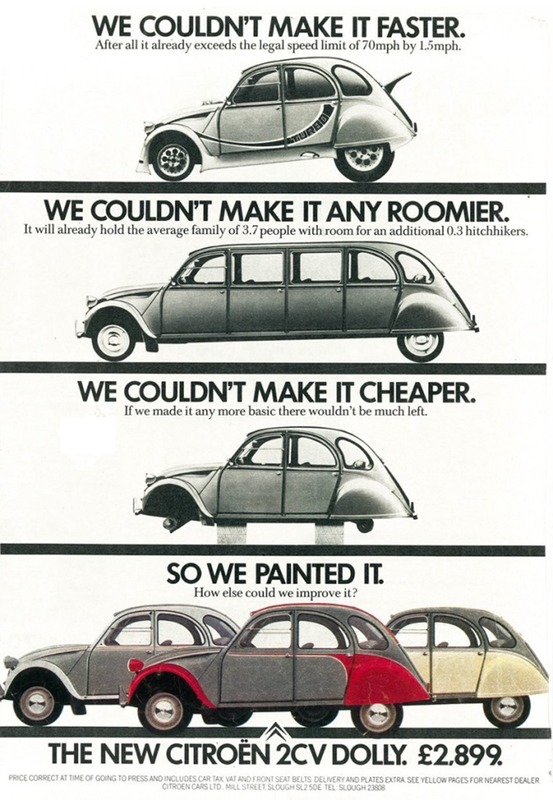 Citroen managed that perfectly with the 2CV, as did Morris with the Minor and Mini and VW with the Beetle. Land Rover did the same with its first car and every successive version of it, but there remains a question mark over the next Defender that it will be too style-led. Time will tell. 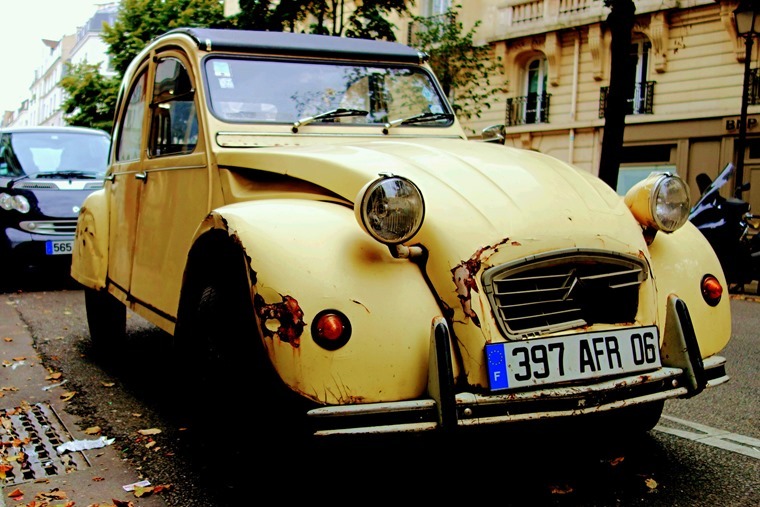 Back with the 2CV as inspiration for the modern day, it stands scrutiny on other fronts. Here was a car that put light weight and a small, robust engine at its heart. Of course, current safety requirements mean it would be all but impossible to make a car as featherweight as the 2CV without resorting to expensive composite materials. Even so, a supermini-sized car that tips the scales at less than 1000kg should be easily achievable. 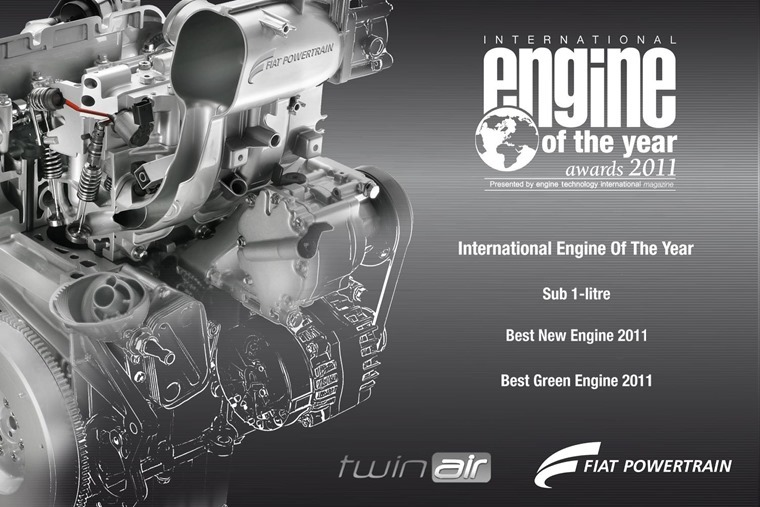 As for the engine, two cylinders is more than enough to have fun with, as proved by Fiat with its excellent TwinAir motor in the 500. 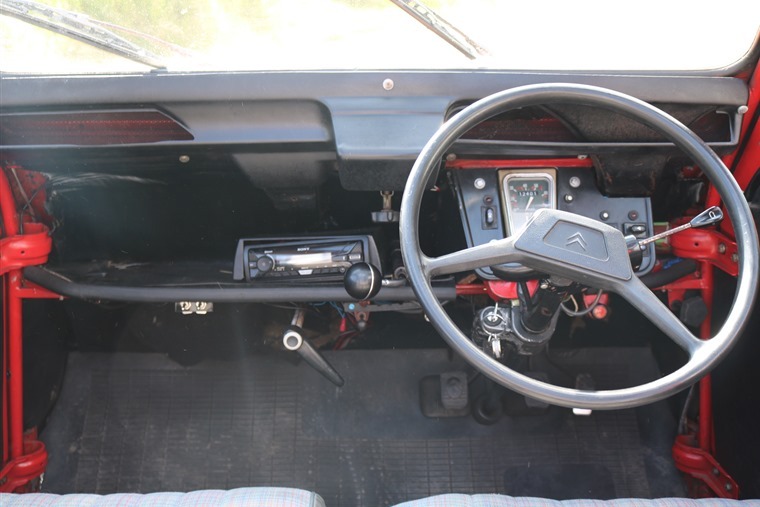 Using a ‘boxer’ layout as in the 2CV has another benefit as it keeps the weight lower in the chassis for better handling. Just ask Porsche why it sticks with a ‘flat six’ in the 911. Performance need not be a disappointment with a small capacity engine. As we’ve seen in plenty of cars launched in recent years, turbocharging can work wonders for pace and efficiency, so combining this with a lightweight design would be the ideal mix, perhaps even with a hybrid element. Some will say the big hurdle to all of this is modern buyers expect a level of luxury and sophistication that just didn’t exist in 1948. That’s true to a degree, but there will many more willing to forego electric door mirrors and seat adjusters, leather upholstery and panoramic glass roof if the price and running costs are right. Wrap that in a lease deal that takes care of that in a single easy payment and you’re on to a winner. 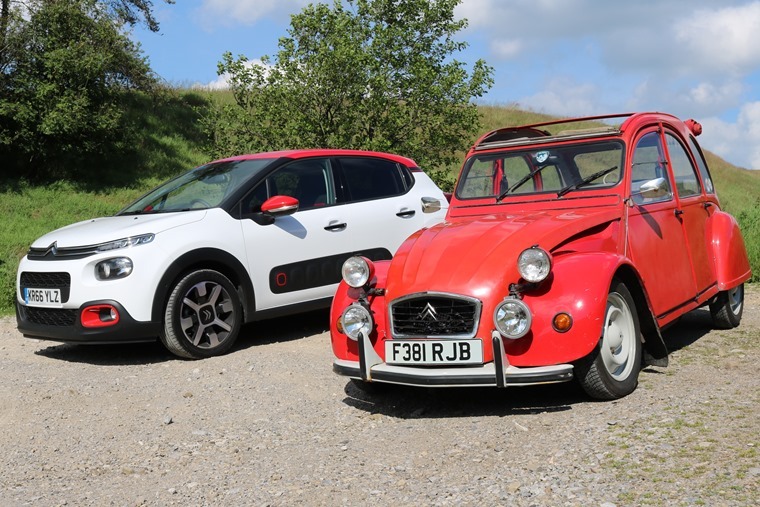 So, while we fondly remember the Citroen 2CV as it hits three score and ten, we should also be looking to the future and asking: where’s the next 2CV?